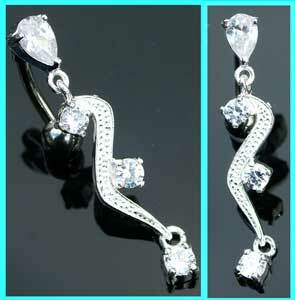 This 10mm surgical steel reverse belly bar has a clear jewelled sterling silver squiggle design, and is worn inserted downwards into the piercing. The 10mm surgical steel barbell is set with a clear teardrop jewel and the 925 silver squiggle has 3 smaller clear jewels. The whole design measures 35mm (approx). Powered by ShopFactory to sell P10782 online. All-in one eCommerce and online shopping cart software.